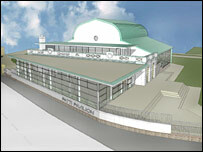 The Patti will be used as a "multi-functional space"
Swansea's historic Patti Pavilion is set to be transformed into a "leading leisure and major entertainment venue". The £3m revamp of the landmark building is expected to begin this summer. There are plans to refurbish the existing building, and construct a "glazed wing" housing a brasserie-style café bar and restaurant. It is anticipated that the completed project will boost tourism and provide more than 70 new jobs for the city. The Patti will be used as a "multi-functional space" for concerts, conferences, and weddings. 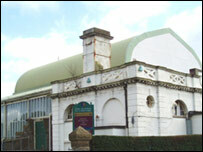 The Grade II listed building was originally built in 1881 for the winter gardens at Craig y Nos Castle, the Swansea Valley home of the Victorian opera star Dame Adelina Patti. She left instructions that after her death the pavilion should be left to the people of Swansea. It was transported from the top end of the Swansea Valley to Victoria Park in 1920, and now stands overlooking Swansea Bay. The Patti has recently hosted a number of musical entertainment and cultural events. The refurbishment project is subject to final planning approval and initial building consent. Work is expected to begin in the late summer. Swansea Council sees the rejuvenation of the Patti as a key element of the city's strategy for leisure and tourism. Leader of the council, Councillor Chris Holley said: "I am delighted that this project to restore the Patti Pavilion to the city is now back on course. "It meets all of the Council's criteria for the successful development of this important area of Swansea for local people and tourism." "The plans here are for a fantastic seafront venue"